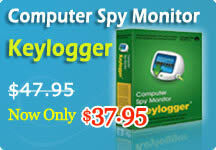 Computer Spy Monitor Keylogger is a power stealth PC Spy software that lets you know EXACTLY what others do on your PC while you are away; an invisible Keylogger which allows you to secretly record all activities of PC users including all keystrokes and screenshots captured; Moreover, it supports to remote monitoring through logs report delivery via email without any physically need. It monitors and record all latest version Windows Live Messenger / Skype / MSN Messenger / ICQ / AOL Messenger / AIM / QQ / Yahoo! Messenger's chat conversations. It also logs the username and password used to login in a messenger. You will know what was typed, where and when it was typed, and you will know who he /she takling is to. It logs all keystrokes. It not only logs English characters, but also records keystrokes all characters of the world, like Chinese characters. It is really a perfect Keylogger. It automatically captures screenshots of entire desktop or active windows at set intervals. Save screenshots as jpg format images. It continually takes snapshots of whatever is on the computer screen. These snapshots can be taken as frequently as every second. This gives you an extremely accurate and visual view of what the person you are monitoring has been doing on the computer. This Keylogger supports to logs delivery via email. It can automatically deliver the logs including the screenshots captured and keystrokes typed via specified email at set interval. You can monitor the PC user remotely no need being on machine physically. Home keylogger - Computer Spy Monitor Keylogger is completely invisible to computer users - No trace in Add/Remove Programs, Start menu, Applications, and no icons, shortcuts or other items.